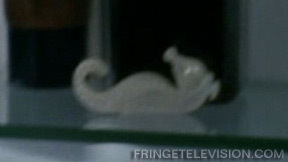 A hidden seahorse can be found in Alistair Peck's bathroom cabinet. This is very similar to the seahorse glyph shown before commercials. It turns out that hidden glyphs were also spotted on the door of the liquor store in Of Human Action, and in the graffiti of Momentum Deferred. Could this be a recurring Easter egg theme that has been in every episode? If anyone wants to look, screenshots from every Fringe episode are available on FringeFiles.com. Interesting that all three are of the seahorse. Yay I spotted something and pointed it out! !